Last week I gave a talk at the Conference for Parliamentarians hosted by the Information Commission as part of Right to Know Week. During the panel I noted that, if we are interested in improving response times for Freedom of Information (FOI) requests (or, in Canada, Access to Information (ATIP) requests) why doesn’t the Office of the Information Commissioner use a bugzilla type software to track requests? In short such a system would bring a lot of transparency to the process itself and, I suspect, would provide a powerful incentive for ministries and individuals to improve their performance in responding to requests. Interestingly, an FOI or ATIP request really isn’t that different than a “bug” in a software program. In many ways, bugzilla is just a complex and collaborative “to do” list manager. I could imagine it wouldn’t be that hard to reskin it so that it could be used to manage and monitor access to information requests. Indeed, I suspect there might even be a community of volunteers who would be willing to work with the Office of the Information Commissioner to help make it happen. Below I’ve done a mock up of what I think revamped Bugzilla, (renamed AccessZilla) might look like. I’m put numbers next to some of the features so that I can explain in detail about them below. So what are some of the features I’ve included? 1. Status: Now an ATIP request can be marked with a status, these might be as simple as submitted, in process, under review, fixed and verified fixed (meaning the submitter has confirmed they’ve received it). This alone would allow the Information Commissioner, the submitter, and the public to track how long an individual request (or an aggregate of requests) stay in each part of the process. 2.Keywords: Wouldn’t it be nice to search of other FOR/ATIP requests with similar keywords? Perhaps someone has submitted a request for a document that is similar to your own, but not something you knew existed or had thought of… Keywords could be a powerful way to find government documents. 3. 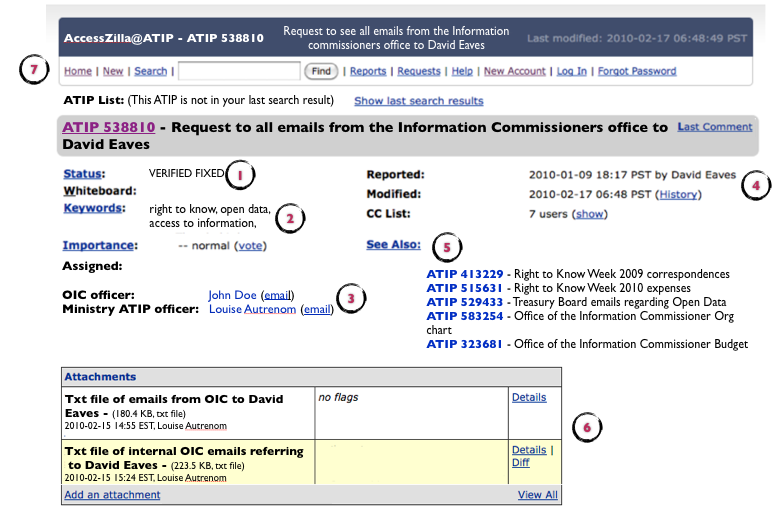 Individual accountability: Now you can see who is monitoring the request on behalf of the Office of the information commissioner and who is the ATIP officer within the Ministry. If the rules permitted then potential the public servants involved in the document might have their names attached here as well (or maybe this option will only be available to those who log on as ATIP officers. 4. 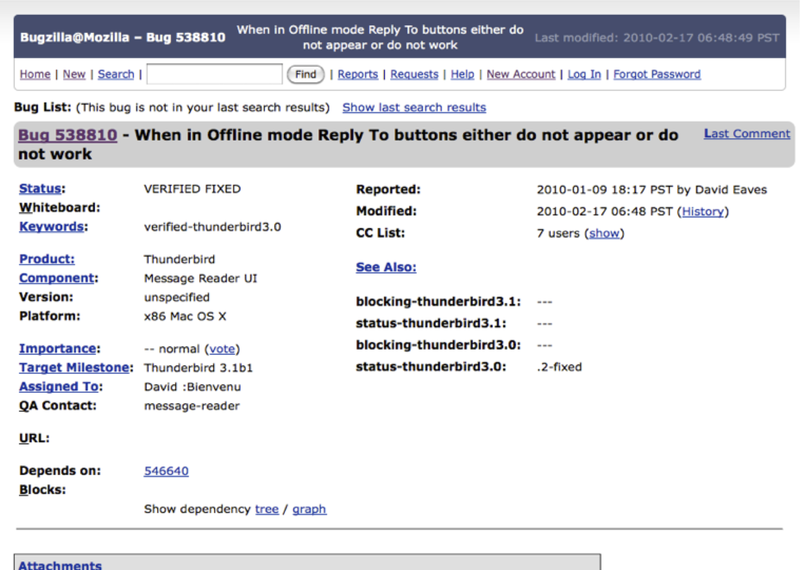 Logs: You would be able to see the last time the request was modified. This might include getting the documents ready, expressing concern about privacy or confidentiality, or simply asking for clarification about the request. 5. Related requests: Like keywords, but more sophisticated. Why not have the software look at the words and people involved in the request and suggest other, completed requests, that it thinks might similar in type and therefor of interest to the user. Seems obvious. 6. Simple and reusable resolution: Once the ATIP officer has the documentation, they can simply upload it as an attachment to the request. This way not only can the original user quickly download the document, but anyone subsequent user who stumbles upon the request during a search could download the documents. Better still any public servant who has unclassified documents that might relate to the request can simply upload them directly as well. 7. Search: This feels pretty obvious… it would certainly make citizens life much easier and be the basic ante for any government that claims to be interested in transparency and accountability. 8. Visualizing it (not shown): The nice thing about all of these features is that the data coming out of them could be visualized. We could generate realt time charts showing average response time by ministry, list of respondees by speed from slowest to fastest, even something as mundane as most searched keywords. The point being that with visualizations is that a governments performance around transparency and accountability becomes more accessible to the general public. This entry was posted in open data, open source, public service sector renewal, technology and tagged accountability, ATIP, bugzilla, mozilla, open source, transparency on October 4, 2010 by David Eaves. Your idea has a lot of merit. It really is issues management. Take a look at BugNET. It might be easier to use. Hi David, I think this is an interesting idea, but this may reflect my ignorance, but is the Information commissioner the place for this? I thought each department (not ministry) in the federal government manages its own ATIP requests. I’m a public servant and I’ve never dealt with the information commissioner’s office in terms of a request. I think they simply investigate issues and track data on how well departments (again not Ministries..) apply the laws governing access to information. That may make it more difficult to coordinate in practice, as I don’t believe that the information commissioner currently has a role other than oversight broadly defined. I’m not in the ATIP world, so I may be wrong, but as far as I can tell that’s the case. That being said, I agree that there may be ways to enhance the process through this kind of process, as well as opening up more data. Justin – departments do have their own ATIP officers. But I don’t see why this type of approach couldn’t be implemented in a coordinated effort. Arguably citizens also don’t care more about getting the information than they do about which department it came from. I envision something where akin to a portal that aggregated the search functionality across all requests while allowing each department to submit their own data. You could start a group to start their own without the government. People could post documents they’ve already received if they see a “bug” filed against it. Bugzilla is incredibly collaborative. All the people with all the different ministries who normally handle the requests can be given the right permissions to use the single instance of Bugzilla to handle their requests, ie if someone requests something from one ministry, that request can automatically be emailed to the right person – just like how the different teams at Mozilla use the same one. As far as I know — and, in this area, that isn’t very far — the answer is that the Info Commissioner doesn’t have any power to coordinate ATI requests. That power lies largely with the individual departments, and with coordinating bodies like the Treasury Board. There used to be a govt-wide ATI request database called CAIRS — certainly not a collaborative system like you’re describing, but the first step. It was run by the Treasury Board, and was killed a couple of years ago. I know the Dept of Defense has a public page listing all ATI requests (and that they’ve been praised by the Info Commissioner for doing this, and that they’re pretty much the only people doing this). Again, not collaborative at all, but at least the willingness to do something mildly helpful. I think the best possibility for something useful here is a private effort. See whatdotheyknow.com (in the UK, by the wonderful mysociety) or visiblegovernment.ca/projects/atoi for notes toward a Canadian version (trickier, because of the payment requirements and paper-centrism of the Canadian system). It’d be great to get some ideas from experienced ATI users about how to make requests simpler and more collaborative. You are correct, the Office of the Information Commissioner does not oversee ATIP requests from a transactional perspective. That said, when I suggested this idea last week their seemed to be a lot of interest and there is nothing stopping the office from tracking them as an interested observer (similar to what you were suggesting Michael). What’s nice is that they have a mandate and a budget so they could potential give such a project some sustainability. Yes, I was going to mention whatdotheyknow. I think you’re really onto something here. I had a very similar idea of creating an app to facilitate the process of fulfilling FOI requests. I also think this opportunity sits in a class of opportunities whereby government processes can be augmented by externally provided systems. Provincially, the BC Bid system is another such example. Any system where there are no privacy concerns is a potential opportunity for government to leverage the community. This especially makes sense when it comes to open data. Thinking about the potential for reporting and business intelligence systems alone is pretty amazing. This is why I continue to remind folks whenever I get the chance, to just get the data released in a free machine readable format. That’s the only part we non-public servants can’t do. Why not just use a SaaS and/or open source CRM application like SugarCRM, SalesForce’s ServiceForce etc. Seems to be a closer fit than gub tracking software. And in SalesForce’s case in addition to most of the requirements you list in your post you’d probably get better reporting and build in social components to improve communication. This is a great idea! :-) Bugzilla has already very successfully been used to coordinate massive work in a US Government context (see NASA’s use of Bugzilla to track problems with the process of building the space shuttle across the entire agency and all contractors). The US Government does have a central information office, and the current administration has a really intense interest in transparency, especially through digital means. How would we get such an effort off the ground, though? I’d be happy to participate in talking to whomever would be the right person, but how would we get those contacts? Would be a worthy replacement to the discontinued (in 2008) Coordination of Access to Information Requests System (CAIRS) that TBS used to administer.